Why Do I See An Error About Root Domains? When you uploaded your URL list rmoov detected that some root domain URLs were included. To put it more simply, some of the URLs in your list are the home pages of those domains. In effect you are telling rmoov that some of the links you want to remove are located on the home pages of their domains. Since uploading only root domains is a mistake that people sometimes make, rmoov has a built in default which queries your upload when it detects root domain URLs. rmoov crawls the URLs you have loaded in your campaign to see whether the links are still present on those pages before sending mail. When links are no longer visible (or are nofollowed) those URLs are ended and withdrawn from campaign activity. When all URLs for a domain are ended, then the domain will also be ended. When a domain is ended, mail will no longer be sent. 1. 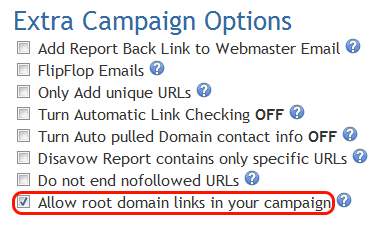 If you need rmoov to allow the upload of root domain URLs because you do actually have some links that are located on home pages, just check the box to apply the manual override in the Campaign Editor. The diagram below will show you how to set the override option. Once you have checked the box and clicked Save Campaign to set the override you will need to re-upload your URL list again to add the root domain URLs that were excluded. 2. If you have accidentally loaded a list of domains instead of a list containing specific URLs, just leave the box unchecked and upload the correct list.